Volunteers, including a group of middle school students, collected donated goods at 18 Giant Supermarkets throughout Montgomery County it's annual MLK Service Weekend Food Drive. See photos. Silver Spring, Md. 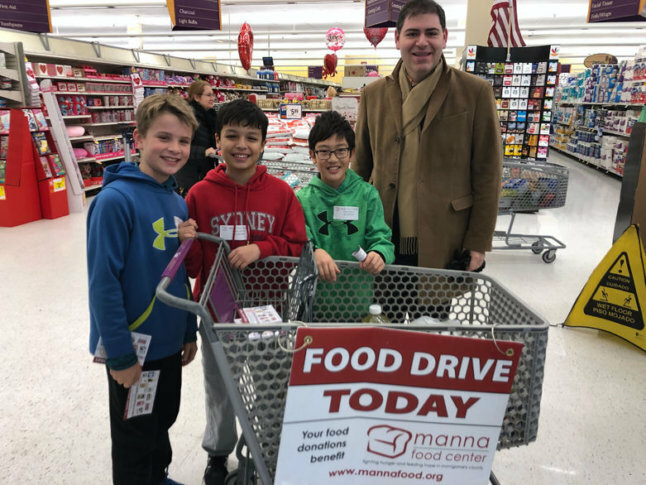 — Over 200 volunteers, including students and elected officials, joined Manna Food Center on Sunday for it’s annual MLK Jr. Service Weekend Food Drive. Volunteers collected donated goods at 18 Giant Supermarkets throughout Montgomery County, including locations in Wheaton, Olney and Neelsville. Each year, the nonprofit helps provide meals for about half of those facing food insecurity in the county and works with schools to help feed students. Whittaker says assistance from community members at events like this helps spread awareness. A group of middle school students were among those volunteering and encouraging shoppers to donate. Connor Kim, a sixth grader at North Bethesda Middle School, said he is volunteering to help those impacted by the shutdown. “It makes me feel amazing because I know that I’m helping people,” said Kim. Some elected officials also stopped by to volunteer, including Del. Jared Solomon (District 18). He applauded Manna Foods for waving income requirements, allowing furloughed federal employees to also seek assistance.